Paper boat river races, belly dancing and fireworks are just a few of the events that will be taking place on Sunday, September 6th in Frenchtown during its annual Riverfest Celebration. The festivities kick off at noon and will go well into the evening. Visitors will be dancing in the streets to the sounds of The Saddletones, The Wallace Brothers, Vinyl Connection and other favorite bands. Eyes of the Wild will be back to entertain and educate us on critters great and small. There will be a variety of local artists and environmental exhibits along Bridge Street and shops will be featuring in-store entertainment and sales. This year’s event will have an added BBQ flavor at various venues around town! Visitors also can take historic walking tours of the town. Tours will start at The Book Garden. Anyone interested in Frenchtown’s history is invited to take a walking tour with longtime resident Rick Epstein. He is a former editor of Frenchtown’s Delaware Valley News and the Hunterdon County Democrat. The tours, which last about 45 minutes, will begin at 1 and 3 p.m. The price of the tour is $10 per person, payable at the end of the tour if you think it was worth it! Riverfest is organized by the Frenchtown Business and Professional Association; and sponsored by TD Bank, Stem Brothers, Shenberger Insurance, H.J. Opdyke Lumber and River Mills at Frenchtown. 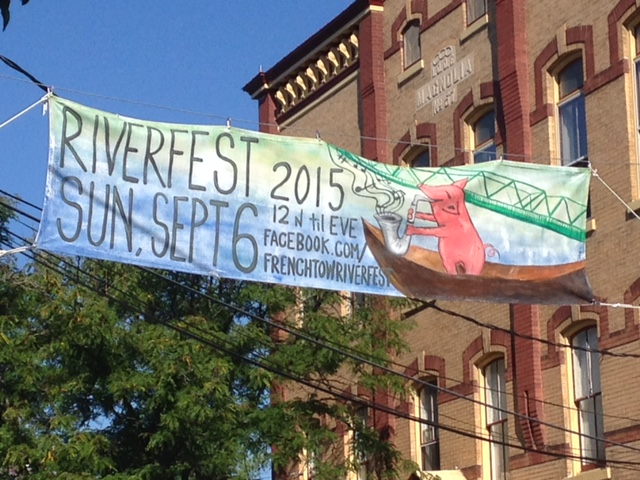 Riverfest will be held on Sunday, September 6th starting at noon. For more information visit Frenchtownnj.org or Frenchtown Today on Facebook.